The ever – growing demand for energy – driven by steady population and economic growth as well as continuous advancements in lifestyle – presents serious challenges for today’s global societies. Strong efforts have been made to reduce local and global emissions of greenhouse gases and in the course of creating a sustainable cycle of energy production and consumption. The utilization of alternative renewable energy sources (e.g., solar and wind energies) and the implementation of all-electric vehicles (EVs) would be the most suitable, ecologically friendly and cost-effective pathway to meet future energy demand growth and the replacement of traditional energy sources. However, the development of a cost-efficient electrical energy storage system able to ensure high energy density and long cycle life for plug-in electric vehicles (PEVs) or grid-scale stationary storage still remains a challenge. In the past years, lithium-ion batteries (LIBs) have strongly evolved, conquering the market of portable electronic devices. However, current commercial LIBs manufactured with conventional lithium transition metal oxide cathodes (e.g., LiMn2O4, LiCoO2, and LiFePO4) cannot satisfy the upcoming energy-market requirements due to their restricted specific energy densities—up to 400 Wh/kg. To address the energy demands of tomorrow, development and implementation of new energy storage alternatives are highly required. Fig. 1. Schematic configuration of the Li–S cell with a RuO2/mesoporous carbon-coated separator. The cell configuration is composed of, from left to right, a sulfur cathode, the functional hybrid separator, and a lithium anode. Due to the outstanding high theoretical specific energy density of 2600 Wh/kg, the lithium–sulfur (Li–S) battery is regarded as a promising candidate for post lithium-ion battery systems eligible to meet the forthcoming market requirements. In addition, sulfur has the enormous advantages of being inexpensive, environmentally benign and naturally abundant, making it an ideal candidate for industrial applications. However, its commercialization on large scale is thwarted by fast capacity fading and the poor cycling stability caused by the Achilles’ heel of Li–S systems: the polysulfide shuttle. This shuttle phenomenon involves the migration of dissolved polysulfides—intermediates formed through the conversion reaction between Li+ ions and elemental sulfur during the discharge process of the battery—between the cathode and the anode, inducing the contamination of the lithium anode surface by redeposition of polysulfide discharge products. In order to tackle this issue, we proposed the reconfiguration of the conventional Li–S cell by using a polypropylene-supported ruthenium oxide (RuO2) nanoparticle/mesoporous carbon hybrid separator which acts as an electrocatalytic and adsorbing polysulfide barrier (Fig. 1). The RuO2 nanoparticles-containing separator coating—covering the side of the separator facing the cathode—not only facilitates the electron transport but also enhances the redox reaction of migrating polysulfides by their early adsorption and trapping in the composite-coating and thus retaining the active material in the cathode side to further improve its reutilization. As main result, Li–S cells with a pure sulfur cathode and the RuO2/mesoporous carbon hybrid separator delivered a high initial discharge capacity (1276 mAh/g at 0.1C) and demonstrated a long-term cycling stability (over 300 cycles) with high Coulombic efficiency (98.2%) and astounding capacity retention (95.7%, over 200 cycles at 0.5C). 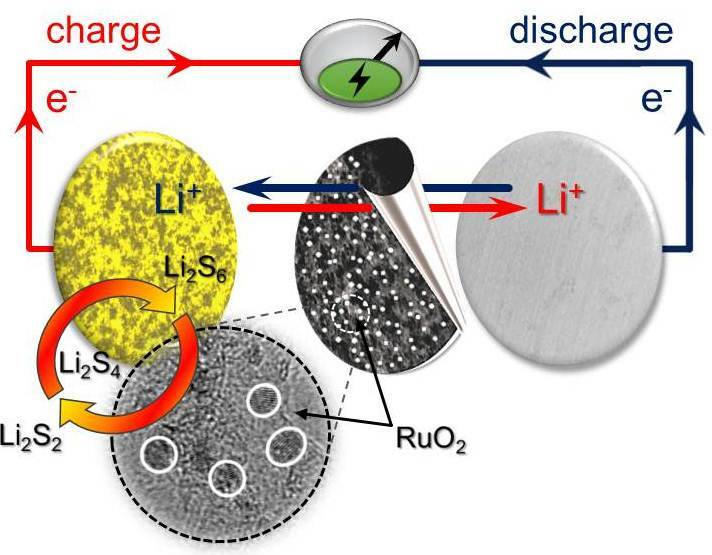 We believe that the implementation of RuO2 nanoparticles in the design of hybrid separators and also as one of the components in sulfur cathodes promises a new perspective for further improvements in advanced Li–S battery systems. Enhanced polysulphide redox reaction using a RuO2 nanoparticle-decorated mesoporous carbon as functional separator coating for advanced lithium-sulphur batteries.